Makhoul Dam in Beth-Nahren, Assyria. by Stephen Grey and Jessica Berry � Spectrum, News Review, page 9, 2002. The ancient city of Assur, once the seat of a mighty empire that stretched from Egypt to the Persian Gulf, is threatened with submersion by a huge dam being built on the orders of Saddam Hussein. Experts believe the Makhoul dam in the Tigris valley, north of Baghdad, may result in one of the greatest archeological disasters of modern times. 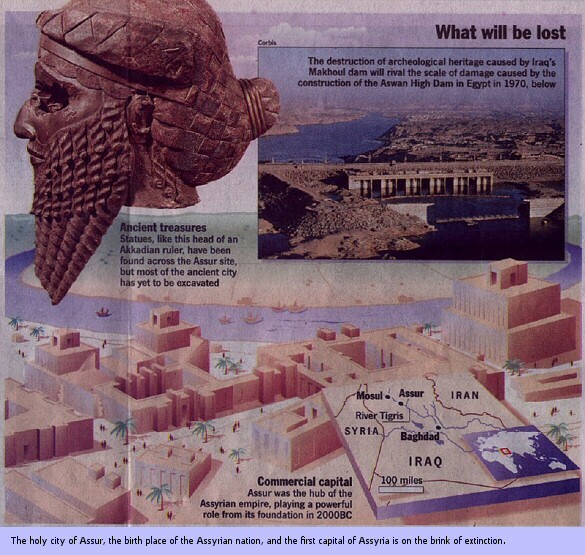 It will create a reservoir 20 miles long that will flood most of the remains of a city founded 2000 BC that stood as the capital of Assyria for more than 1,300 years. At least 100 other historic sites could be lost, including Kar Tukult-Ninurta, an Assyrian city dating from the 13th century BC. Saddam's regime confirms that approval for the dam, 80 miles from the northern city of Mosul, has been given, and Iraqi dissidents say work has begun on the foundations. Assur has been under excavation since 1847, when Austen Layard, a British archeologist, began to unearth its treasures, and continued at the turn of that century with discovery of tablets giving a record of the city and its layout. However, most of the site remains unexplored. Of 34 temples, barely a third have been excavated, and archeologists believe great works of art from the royal workshops of the 13th century BC are still buried. Flood waters from the dam would destroy them. 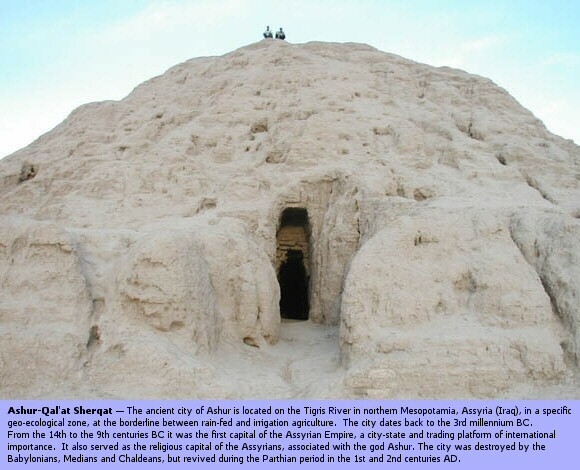 Assur was described by Dr. John Curtis, a leading authority at the British Museum, as �arguably the most important archeological site in the Near East�. The losses, he said, could be worse than those caused by the Aswan High Dam in 1970, when temples along the Nile were flooded. Last week Iraqi officials urged the world to save Assur�s artifacts, or to help find an alternative solution to the country�s shortage of water. The regime, claims that after three years of drought it is being forced to build a dam because Turkey is holding back water from the Euphrates and Tigres rivers. However, its appeal for help was met with scorn by Baroness Nicholson, the Liberal Democrat MEP, a campaigner for opponents of Saddam whose native marshes have been systematically drained in the southern part of the country. Any help for Assur would be complicated by American attempts to gather support for military action aimed at toppling Saddam. Kofi Annan, the UN secretary-general, failed last week to persuade Iraq to accept the return of weapons inspectors, and a Pentagon plan for a land, air and sea assault early next year involving tens of thousands of troops was leaked to The New York Times. On Friday exiled Iraqi military officers will gather in London for a conference hosted by the Iraqi National Congress (INC), the main democratic opposition to Saddam. The conference is aimed at persuading the dissident officers to commit to a new armed rebellion. Ahmed Chalabi, the INC leader, said Saddam was using the Makhoul dam project for cultural blackmail. �These antiquities are a legacy not just for the Iraqi people but for the whole of humanity,� he said. 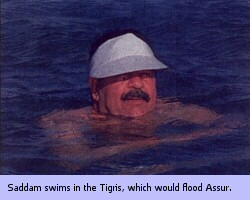 He added that the reservoir would cover not only Assur but the mass graves of Kurds who had been killed in the 1980s. World Heritage Center - convention concerning the protection of the world cultural and natural heritage, for example, Ashur (Qal'at Sherqat).